Make sure that you join us at AEG GRIND on April 15 at 1:30 pm SLT to experience live music from Isabella Rumsford aka Andreea Keller. Isabella is an incurable romantic. This young and remarkably talented musician who makes you feel every note she sings. She studied music at University specializing in canto and piano. She has a versatile repertoire with an exceptional voice quality reminiscent of great singers such as Etta James, Celine Dion and Whitney Houston. Her sincere dedication to music is heard and felt in her insatiable love of opera, an art form she feels isn’t appreciated enough by young musicians of our time. She brings to all music genres her diverse and amazing potential filled with meaning, passion and an experience far beyond her years. Her voice delivers the music in an elegant manner that conquers every skeptic and consistently melts our hearts”. I was born in Romania where I began my career in music. The first contact I had with the stage was through pop and dance music. I owe much of my success to the support of my parents and the people who appreciated me and my potential. 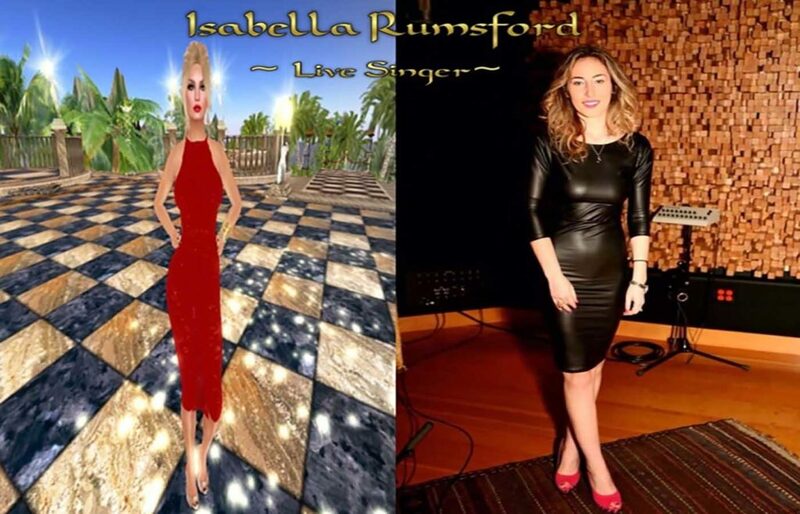 I performed as an opera singer in much of Eastern Europe and now I’m bringing my art to Second Life where I want to play for many other people around the world who I feel will enjoy and appreciate my ability and passion for music. Though I sing mostly popular romantic soul, blues music, my greatest desire is to sing opera in Second Life where I believe there is a genuine love of this noble art form as well as an audience that is perhaps yet undiscovered. My favorite opera singers are Mariana Nicolesco, Montserrat Caballe, Anna Netrebko, Renne Fleming, Renatta Scott, and Luciano Pavarotti all of which have inspired me over the years and have kept me striving for perfection in my art. This Event is sponsored by LTMODA – designers of fine womens clothing in Second Life.